This picture is here simply because I want it to be here. It has two of my favorite things. Typewriters & Lanterns. There is something about typewriters and me...I think we have a connection. I always end up posting snaps of them here. Do you like them too? I think I have a vague idea of what my next month's fetish is going to be all about...wink wink! That pop of pink amidst all that black & grey & silver does the trick. I have a feeling this a cozy tent in midst of deep deep forest. May be if I walk out of this tent I will find the typewriter & the lantern you just saw. Yes, I am sure I will. Such striking interiors. 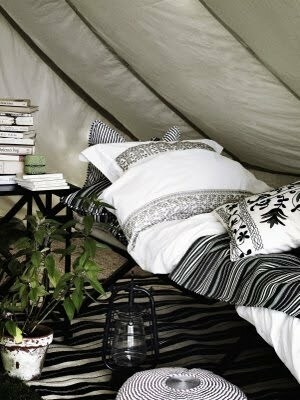 Prints & stripes, Black & white, that potted plant, the sleek table, so many books..ah and such an inviting bed! I am all ready to leave the city and shift here! I think Ive already told you how I love and miss typewriters as well. My mom had given hers to my nephew and he kept on asking where the screen and enter button is. 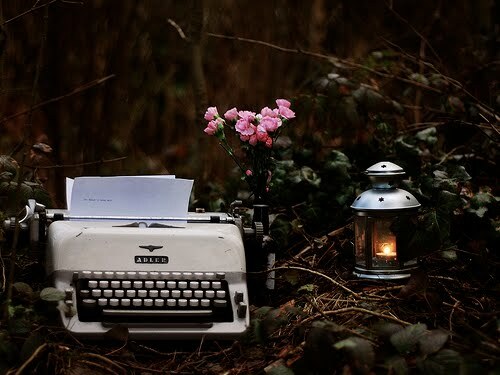 Love typewriters and having a lantern too just makes it that more special! Thanks for sharing! Aneela : well...can they be blamed...a child i know typed without the paper and expected it to be printed later :) cute! Sharon: You've just made it all seem so romantic and poetic! Rachel: awww...you love them too..then you are goin to love my july fetish!